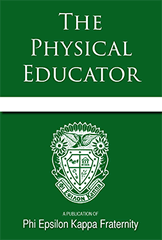 Originally published in 1940 by Phi Epsilon Kappa as a quarterly publication for its fraternity members, The Physical Educator is one of the longest standing journals providing research-based articles relating to physical education, health, recreation, and related areas. This quarterly periodical is now available for non-members and libraries. Phi Epsilon Kappa Fraternity is a national professional fraternity for persons engaged in or pursuing careers in physical education, health, recreation, dance, human performance, exercise science, sports medicine, and sports management. Subscribe to The Physical Educator. Physical Education: A Literacy-Based Approach is a book that is intended to facilitate the understanding and application of the ELA Common Core State Standards for both inservice and preservice physical education teachers. The book includes chapters that detail what the ELA Common Core State Standards are as well as how to implement and assess them in physical education. Features of the book include several examples of how to link the ELA Common Core State Standards to both the national physical education standards and the national grade level outcomes for physical education. In addition, two chapters provide descriptions of specific activities that align with the ELA Common Core State Standards. Today in education, physical education teachers are being required to support literacy through teaching physical education content. 72.5 Special Issue - Open Access! Physical Education Class and Body Image Perception: Are They Related?